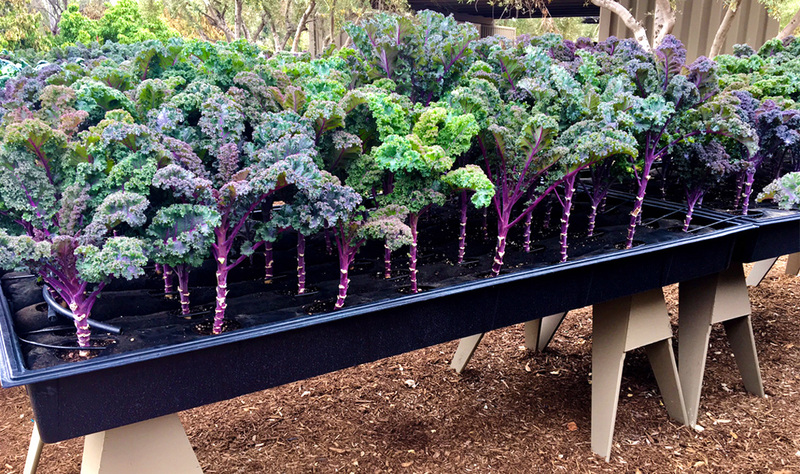 Alegría Farm, located at The Nursery in Irvine, CA is a zero-waste, solar-powered one-acre regenerative urban microfarm employing hydro-organic and 100% organic soil-based growing systems featuring our SoxxBoxx system. We design zero waste high performance farms that repurpose unused spaces deployed over man-made surfaces close to where people live and work. We call it "tractorless" farming. Our optimized soil biology results in superior nutrient dense vegetables, salad greens, fruit, flowers and medicinal herbs. Our locally grown produce is clean and natural and requires no toxic pesticides. At Alegría's Green Farmacy, we grow more than 80 heart healthy cultivars using the most resource-efficient processes - up to 90% less water, 50% less fertilizer, 90% less energy and 70% less land than conventional farming. To maximize freshness, Alegría produce is delivered locally within one hour of harvest, assuring our clients receive optimum flavor, texture and nutrition while reducing the environmental impact from transporting produce across continents. All Alegría Fresh seedlings originate from certified non-GMO seeds. This year, Alegría Fresh heirloomed more than 300,000 seeds from its crops. The Alegría Farm is solar powered and off-the-grid and uses state-of-the-art battery storage systems designed and built by SimpliPhi in Ojai, CA. Alegría Fresh, a high performance urban farm company, originated in Laguna Beach, CA in 2009. The Alegría team, led by its founder and Managing Director Erik Cutter, utilizes high-efficiency hydroponic vertical farming and natural, nutrient-dense Soxx systems to produce and distribute superior, locally-grown salad greens, herbs and vegetables. Erik has over 35 years experience growing food using natural, nutrient-dense techniques and is a leading pioneer in developing the use of hybrid food production technologies that are far more resource efficient than traditional farming processes. With a background in Biochemistry and Oncology, Erik possesses a lifelong passion for creating haute cuisine using the most nutrient-rich locally-grown ingredients. Erik introduces youth and local residents to the amazing benefits of consuming clean & natural food. The team's work includes connecting individuals with where their food comes from and how it is grown, influencing positive change in resource management, teaching healthy eating habits, promoting entrepreneurship programs and creating jobs in urban agriculture. Erik and his team of collaborators which include A.G. Kawamura, ex-Secretary of Agriculture of California, are developing new urban food production systems to develop profitable urban farms using drought resistant farming techniques. Alegría's primary mission is to employ scalable technologies and develop greater resource efficiencies to provide superior food within the urban envelope, educate youth and veterans how to grow their own food, create greater access to highly nutritious produce and develop jobs in urban agriculture. Find out today how you can boost your energy and improve your health by eating the cleanest, just-picked greens and vegetables from Alegría Fresh.